Okay so we are going to take a short break from the sneaks, but not to worry, we'll be back in full force on Monday! In the meantime we'll do a give away! We will be giving one lucky person a copy of Creating Keepsakes latest special issue! So here's the deal, tell us what your favorite season to scrap is. Let us know by midnight PST on Friday to be entered to win!! My favorite season to scrap is summer. I love to use orange, turquoise, lime green, and red in my color schemes and summer pictures always seem to have those colors! Fall I love the warmth of fall colors. Loving the look of this issue! My favorite season to scrap is definitely Summer. All those trips to the pool, get-togethers, amazing colors everywhere...I love it! Summer is my favorite season to scrap. The photos are usually bright and happy. I prefer the summer, the kids get to go outside and explore. There are flowers to pick, trees to climb and bugs to capture! Plus we always end up with a batch or two of kittens! I love all their issues!! I wish I had a subscription!! Fall is one of my favorite seasons to scrap because of the warm colors and fun subjects such as football games and Thanksgiving! Thanks so much for the chance! I love scrapping fall. It's my boys' birthdays plus I love pictures of leaves! Love fall - there are so many scrapping moments - back to school, Halloween, trip to the farm, Thanksgiving... it's the best! My favourite season to scrap would have to be summer. There are so many more fun outings which are captured on the camera. Summer is my favorite season to scrap! So much to do and the weather is generally gorgeous! My favorite season to scrap is summer. I love Fall!!! I have a huge drawer full of fall goodies. I can't resist a good pumpkin. I love to scrap summer. The bright colors are just my favorite to work with. I love to scrap fall because I love working with greens and orange! Spring! Lots of yellows ! I love to scrap pictures from Fall. Love the colors and textures. I like summer, I like all the fun bright colors and we are very active in the summer so I always take lots of pictures. winter for sure. It is cold and dark and scrapping is a productive enjoyable thing to do. I love spring! Easter is my favorite holiday to scrap! Any time when my 23 and 28 year olds are home together is ,y favorite season to scrap! One has a job and the other is in grad school half way across the country. It is more and more difficult to get together as a family! Fall is my favourite season to scrap! I love the colours, and patterns! My favorite season is Fall!! I love the colors, the leaves, pumpkins, apples, trees, I love it all!! 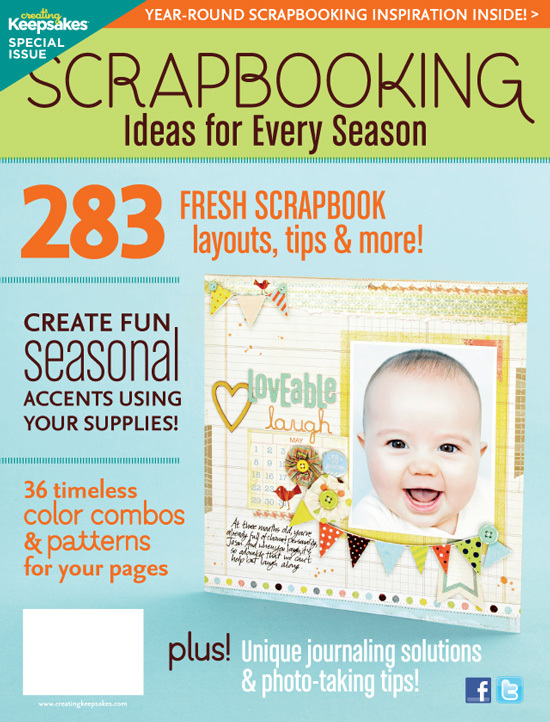 Thank you for a chance to win this Awesome Scrapbooking Book!! Hmmm...is this a trick question? My favorite season is Autumn (my stash of fall-colors will prove that), but I actually find that I choose my papers to coordinate with colors in the photos, so I actually scrap more Spring colors and patterns (not pastels; bright happy colors) than the warm Autumn tones. This question really made me think...thanks for the mental exercise. SPRING. Final answer. My favourite season to scrap is summer! My favorite season to scrapbook is FALL. I just love the colors. I always love to scrap the Fall. I married and met my husband in autumn and it remains my favourite season. Summer for sure! The colours are fun and happy! And I don't take many pix in winter especially because I have a medical condition that makes the cold painful. So all my pix are indoors and therefore rarely reflect any specific season and the lighting is drab. I am an avid scrapper all year around. But I love to scrapbook summer photos especially. BRight colours and happy warm faces! My favorite season to scrap is Fall. I just love everything about the color scheme of fall (plus my birthday is in the Fall, so that may be why I am biased towards Fall). Summer is my favorite season, the bright colours and full of life. It is wonderful to scrap that season. Great chance for this possibility to win this issue of CK. Love Christma! Full of magic and wonder! My fave season to crap is summer.. Love the sunny pics and love using bright cors! Thanks for the chance! My absolute favorite season is Fall which is probably why it is my favorite to scrapbook. Love the cooler weather, back to school, pumpkins/apples and Thanksgiving! I love scrapping the summer! So fun and colorful! My favorite season to scrap is fall...I just can't get enough of the rich color palette! Yellows, golds, copper, bronze, deep reds.... too scrumptious for words!! Definitely summer! I love the bright colors and fun photos! I definitely seem to scrap summer a fair bit!! Fun times! I LOVE the warm colors of fall, but I also love the fresh, crisp colors of winter.